After his apprenticeship with Watford, Burgess, a right-back, was unable to break into the first team at Vicarage Road and he moved on to Torquay United. 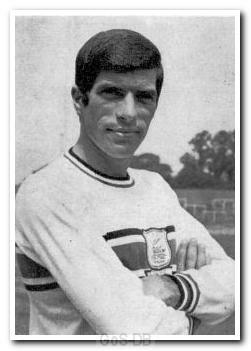 Despite playing regularly over the next three seasons at Plainmoor, he joined Argyle on a free transfer in 1968. A cartilage injury suffered during his first year at Home Park prevented him from securing a regular first team place and he transferred to Colchester United. He retired 18 months later, scoring for Colchester on his last game for the club. I was fortunate to play one season for Prince Rock in the Plymouth & District Premier League and came up against Eric Burgess when he was on his way back from injury and having a run out in Argyle's third team. We were lucky enough to be playing at Home Park and as a left winger I found the impressive Mr Burgess marking me. This was my first and only experience of playing against a Football League player. On the few occasions I was able to get to the ball before him, the Argyle full-back jockeyed me around and relaxedly took me down all sorts of blind alleys before robbing me and setting up a series of counter-attacks. This was a reality check for me. That day I realised how good I wasn't!